Dhaka, 30 April, Abnews: Two blasts hit the Afghan capital Kabul on Monday, killing at least 21 people, including a photographer for French news agency AFP, but there was no immediate claim of responsibility, officials said. Monday's first explosion in the Shashdarak area close to buildings of the NDS intelligence service was followed by one outside the ministry of urban development and housing, just as people were entering the government office. 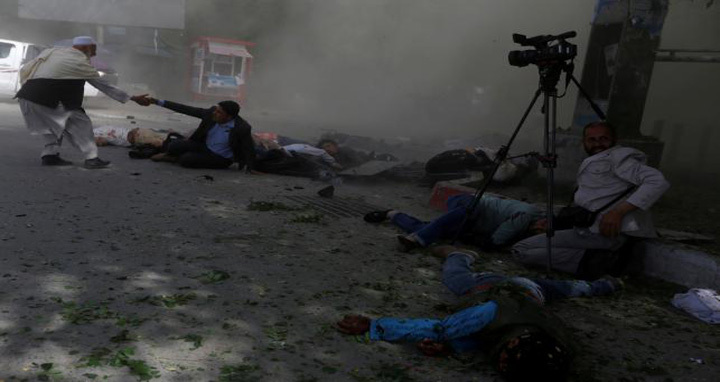 Agence France-Presse's chief photographer in Kabul, Shah Marai, was killed in the blast, the agency confirmed in a Twitter message. Hundreds of people have been killed and wounded in a series of high-profile attacks in Kabul since the beginning of the year, despite President Ashraf Ghani's offer in February for peace talks "without preconditions".